Following the recent fire at the Sony DADC facility in Enfield where all of Eureka's back catalogue stock was destroyed (along with that of over a hundred independent cinema and music labels), Eureka will be combining many of the titles in the Masters of Cinema Series catalogue that previously carried separate Blu-ray and DVD editions into Dual Format editions. The following titles will be made available in the near future in Dual Format (Blu-ray & DVD) editions exclusively: Sunrise and City Girl by F. W. Murnau; Profound Desires of the Gods and Vengeance Is Mine by Shôhei Imamura; The Burmese Harp by Kon Ichikawa; Will Success Spoil Rock Hunter? by Frank Tashlin; La Planète sauvage (aka Fantastic Planet) by René Laloux; For All Mankind by Al Reinert; Tokyo Sonata by Kiyoshi Kurosawa; Mad Detective by Johnnie To and Wai Ka-fai; Une femme mariée by Jean-Luc Godard; The World by Jia Zhangke; Make Way for Tomorrow by Leo McCarey; and M by Fritz Lang. The first to be announced and going into stock is F.W. Murnau's Oscar-winning Sunrise, which made its world Blu-ray debut on the previous Masters of Cinema's 2009 release, which contained two versions of the film: the previously released Movietone version and an alternate silent version of the film, recently discovered in the Czech Republic, of a higher visual quality than any other known source. The culmination of one of the greatest careers in film history, F. W. Murnau's Sunrise blends a story of fable-like simplicity with unparalleled visual imagination and technical ingenuity. Invited to Hollywood by William Fox and given total artistic freedom on any project he wished, Murnau's tale of the idyllic marriage of a peasant couple (George O'Brien and Janet Gaynor) threatened by a vamp-like seductress from the city (Margaret Livingston) created a milestone of film expressionism. Made in the twilight of the silent era, Sunrise became both a swan song for a vanishing medium and one of the few films to instantly achieve legendary status. Winner of three Oscars for Best Actress (Gaynor), Cinematography, and a never-repeated award for "Unique and Artistic Picture", its influence and stature has only grown with each passing year. 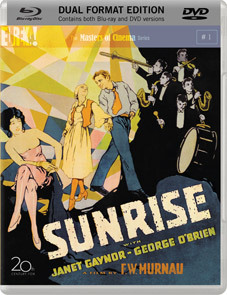 Sunrise will be released on dual format (Blu-ray and 2xDVD) by Eureka as part of the Masters of Cinema series on 12th September 2011 at the RRP of £23.48. Featuring film-restored HD transfers of two both the Movietone and Czech versions of the film, the disc will also include the original English intertitles on the Movietone and optional English subtitles on the Czech, plus the original Movietone score (mono) and an alternate Olympic Chamber Orchestra score (stereo). 20-page booklet with details of the film restorations and comparison of versions.